A tree planted in 1971 commemorates 100 years of Freemasonry in Kiama, on the site of Kiama`s first open air church service and near the site of the first Masonic Lodge which met on the 5th July 1871. Lodge Kiama No. 35 U.G.L. of N.S.W. This plaque unveiled by His Worship the Mayor of Kiama, Ald. 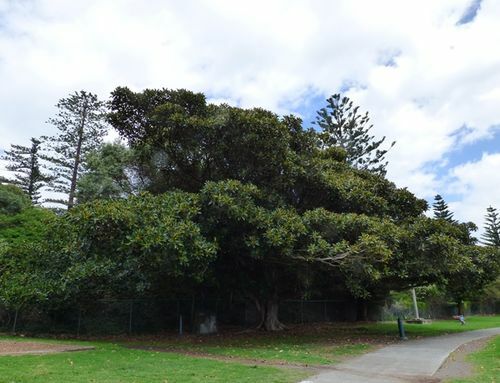 P. J. Saphin, commemorates the planting of a Morton Bay Fig tree, adjacent hereto, by Most Worshipful Bro. Robert Arthur Hammond Grand Master of the United Grand Lodge of N.S.W. on the 3rd July 1971, to celebrate "100 years of Freemasonry in Kiama".